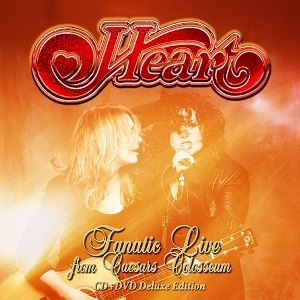 Heart released their last studio album, Fanatic, in October 2012, then went on tour in North America to promote the album. At the Caesars Colosseum in Windsor, Ontario the show was recorded and is now being released as their latest live album - Fanatic live from Caesars colosseum. The band will be touring again in the early part of 2014 (but only in North America). By my count, this is the band's sixth live album, but over the last 24 years that's not bad as they've released new studio albums steadily in that time so the live shows contain plenty of different songs. As this was the Fanatic tour, and the album is billed as "Fanatic live..." then it seems obvious that there will be lots of songs here from the Fanatic album doesn't it? Well if you think that you'd be wrong. In reality, of the 14 tracks here, only 4 of them come from Fanatic. I wondered if they'd chopped out part of the show in order to make it fit on a single CD or DVD, and they have, but only one track was removed and it didn't come from Fanatic. As a result of losing a song the whole album is only an hour and ten minutes long which is a little bit on the short side for a gig or live album. So the question is - Is the album going to interest fans who have the previous live albums? I think it will, yes. Some of the songs such as 'Barracuda', 'Alone' and 'These dreams' appear on other Heart live albums, but as fan favourites that's not a surprise. Most of the songs here haven't appeared on previous live albums so there's still plenty to interest fans who own the other live albums. If you're a Heart fan who lives in the UK or Europe then sadly this is likely to be the closest most people will get to experiencing the band live as they don't tend to tour outside the US and Canada and it's been a long time since they visited Europe - ten years in fact (and that tour came after a 14 year absence from the UK). Still we can always hope they plan a UK/European tour sometime soon. With Heart's live releases being well spaced in time then you not only get the benefit of hearing new tracks performed live, but you get to hear how the band's live sound has evolved over the years, so songs that are on more than one live album don't sound the same on them all. It's a good live album, and fans of the band's recent albums are likely to enjoy this release. If you're more a fan of the 80s albums (Bad animals & Brigade) then this is still well worth a listen, but "Rock the house live!" may be more to your taste. As well as the CD, 'Fanatic live from Caesars Colossem' is being released on DVD and Blu-Ray so fans have a choice of formats to buy. It's also available from itunes and includes an instant download of a new version of the Heart classic song "Dog and Butterfly". The DVD keeps the same track listing as the CD, so a song is missing from the setlist and it's the same running order which is oddly different to the running order at the show itself - quite why they decided to change the order is unclear. I'm guessing it's so they can end with "Barracuda" rather than "59 crunch" (on the night, "Barracuda" ended the main set and "59 crunch" was the first song of the encore, and the final song of the night was a Who cover which isnt on this release. The DVD does include a bit more of the between song dialogue, and is filmed from a number of cameras. The stage is fairly simple and open and means the focus is on the band, and the Wilson sisters in particular rather than on any kind of stage show. The camera angles are generally good and there are enough to work well, although a few more cameras to give more close-ups on band members might have been nice. A great live album from Heart. 'Fanatic Live from Caesar's Colosseum' will be released on 24th February 2014 on Frontiers records.